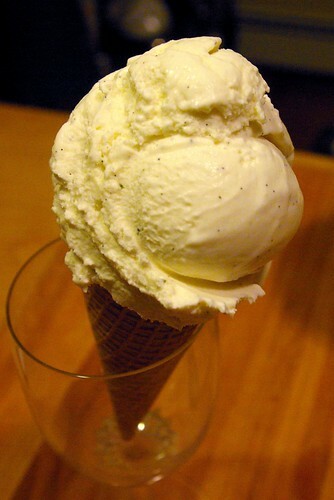 slow churned fresh mint and vanilla bean heavy ice cream, originally uploaded by aarn! +6th April, 2009+. as close as ice cream can get to pure butter, this first batch of vanilla bean and fresh mint ice cream was made with heavy cream which is 36% milk fat (whipping cream is 30%, light cream is 18%, and half and half is 10%...fyi). it was almost too rich to eat. so good. lightly simmered 1c. of heavy cream, 3/4c. sugar, 1/8t. salt, and the seeds and pod from one sliced and scraped maddiegascar vanilla bean in a sauce pan until the sugar was dissolved. removed from heat and whisked in 2c. heavy cream, 1c. whole milk, and 2t. of finely chopped fresh mint leaves, then chilled the mixture for 3-4hrs until at approximately 40-degrees. removed the bean pod from the mixture and strained out the fresh mint pieces, using cheese cloth. slowly poured the mixture into the ice cream maker attachment for the kitchen aid mixer, which had been in the freezer for 24-hrs, and let that slowly churn for 25-minutes or so, then transferred to a container and placed in the freezer for an hour to firm up a little, so that it would hold in an ice cream cone.